In Michael Jackson’s Malt Whisky Companion he describes Rosebank whisky as the “finest example of Lowland Whisky” so before you even get a chance to delve in to a bottle you know your are on to something special. Young Rosebanks tend to be floral and aromatic; older expressions can be more robust and spicy, but with glorious depth. Stocks of the last Flora and Fauna batch (awarded 95 points in Jim Murray’s Whisky Bible 2007) are still available, along with several independent bottlings. 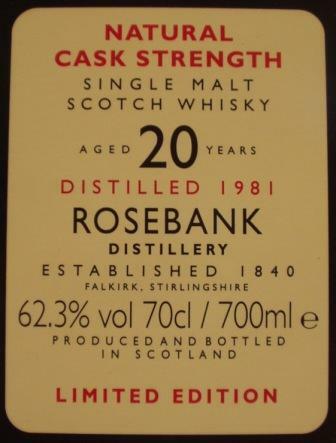 As the distillery is now closed you can expect Rosebank prices to rise with time making them tremendously collectable. Compare prices below to get the cheapest prices guaranteed.